A selection of antique and Victorian earrings from the 1800's with a variety of metals such as guild, gold filled, sterling, 10k, 14k and 18k. 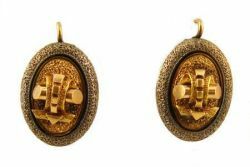 Antique earrings are the most difficult jewelry item to find as over the past 150 + years matched pairs are rarely seen or have been altered greatly from their original design. When found they are highly collectible and coveted items. The most common style you will find on the market have an Etruscan revival design that was in vogue during the later part of the 19th century. In this category you will only find authentic Victorian earrings.